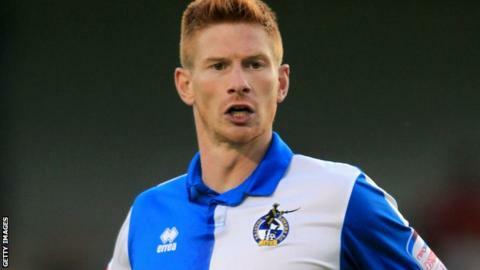 Bristol Rovers striker Matt Harrold has been ruled out for the rest of the League Two season after suffering a serious knee injury. The 28-year-old was forced off the field after 34 minutes in their 4-0 defeat by Gillingham on Saturday and left the ground on crutches. He underwent scans on Monday, which revealed he had damaged his anterior cruciate ligament. Been a poor start to season and wanted to help get us up the table but not to be. Lets get a win tomorrow and get the season going. "It's a real blow to lose him," manager Mark McGhee told BBC Radio Bristol. "I had high hopes for Matt getting 20-plus goals this season. Just because of the poor start we had, those hopes didn't change." Harrold has scored once in six appearances this season, and last term he finished Rovers' top scorer with 18. With defender Cian Bolger also sidelined until Christmas, McGhee confirmed he would enter the loan market to fill the gaps in his squad. And the Scotsman said bringing in new additions is now a priority, as his side look to secure their first win of the season. "We're hugely disappointed with the start we've made," he continued. "We've lost a couple of important players along the way and others haven't lived up to their expectations. "The phone has been red-hot all weekend and we are looking at option in different positions. "We need to strengthen now and look at the combinations that get us the results we want."